Available to pre-order now. Released 2nd December 2016 on LP / CD and digital download. 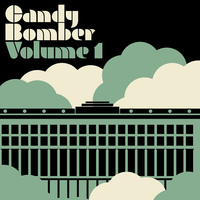 The Candy Bomber sessions were spearheaded by Paul Lemp, co-owner of the studio of the same name, theater, film and dance composer, and impassioned bass player. The sessions were his dream project of free-spirited experimentation into which he injected his boundless energy, teaming up with Thomas Wydler (drummer and longest serving member of Nick Cave & The Bad Seeds) and studio partner Ingo Krauss (Conny Plank's studio engineer between 1987 and 2001) to form a core triumvirate, that spiralled outwards to bring in a who's who of talented friends and studio visitors. In this volume these include Kid Congo Powers, Swiss jazz pianist Stefan Rusconi, Jochen Arbeit (Einstürzende Neubauten/Automat), Gemma Ray, Toby Dammit (Iggy Pop/Nick Cave), André Vida, Toni Kater, Charly Birkenhauer, Paul Kuchenbuch and Matthew Styles. Built during the Nazi era, the building which houses Candy Bomber was once the largest in the world. (a Julian Montague impression of the facade of the building adorns the album cover). In 1948/49 it served as the hub for the Berlin airlift, when the allied forces flew over 200,000 flights supplying the Western part of the city with daily necessities. The airlift also provided the name for the studio, which set up shop in rooms that previously hosted a computing centre for the CIA. The studio is now legendary in Berlin, not least for its enviable collection of vintage valve gear. With this at their disposal, Lemp, Krauss and Wydler established an environment for sessions that were organic, pressure-free and, more or less, agenda-less. The end result is sonic art unimpeded - a wild cocktail of originality, intensity, beauty, sincerity, and stunning freeform musicianship - underscored by a Dada-ist playfulness and motivating force. This is not a work of chin-stroking abstraction however - here you'll find some of the coolest jams, ones that will peel your face off. Tragically, Paul Lemp died prematurely and unexpectedly in summer 2015, before the Candy Bomber sessions were finished. Krauss and Wydler finished the record shortly after, and despite his passing (and as the Vol. 1 title suggests) - intend to continue them in his honour. Limited vinyl LP comes with a digital download code.